Barcode Warehouse only carries the best wax ribbons for use in Zebra G-Series and TLP 284x/384x desktop printers that utilize a 1/2" core and 244’ ribbon. Wax ribbons provide high quality printing on coated and uncoated paper facestocks. Compatible with Zebra G-Series and TLP 284x/384x desktop printers. 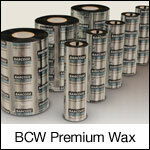 The BCW Premium Wax Ribbon is a resin enhanced formulation for use with coated and uncoated paper stock. Product 4150200 is 2.50" x 244' on a 0.5" core and has 12 rolls per case. The BCW Premium Wax Ribbon is a resin enhanced formulation for use with coated and uncoated paper stock. Product 4150210 is 3.25" x 244' on a 0.5" core and has 12 rolls per case. The BCW Premium Wax Ribbon is a resin enhanced formulation for use with coated and uncoated paper stock. Product 4150220 is 4.33" x 244' on a 0.5" core and has 12 rolls per case.